The Cavaliers’ LeBron James, right, drives past Phoenix’s Davon Reed during Friday night’s game in Cleveland. 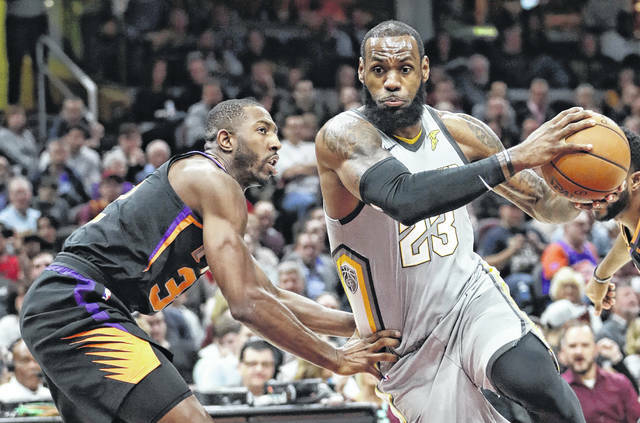 CLEVELAND — LeBron James scored 27 points in three quarters, Kevin Love added 20 and the Cleveland Cavaliers welcomed back three players from injury during a 120-95 blowout Friday night over the sinking Phoenix Suns, who lost their 10th straight game. James added nine assists and six rebounds before watching and cheering from the bench in the fourth while the Cavs rolled to an easy win with their healthiest roster in weeks. Forwards Tristan Thompson, Larry Nance Jr. and Rodney Hood all returned from injuries, good news as Cleveland gears up for the playoffs. Although Nance Jr. was back, Cavs acting coach Larry Drew, sitting in while Tyronn Lue is away dealing with health issues, stuck with his same starting lineup. That could change in the days ahead as Cleveland tinkers with a team that has only been at full strength for one game all season. Nance Jr. finished with 15 points and 10rebounds in 22 minutes. Hood had nine points in 21 minutes and Thompson nine rebounds in 16 minutes. “Well guess what, the inner #IrishPride woke me up 2 mins before tipoff anyways! Let’s go Irish,” James tweeted. The Fighting Irish advanced with a win over Lexington. James joked that when he’s getting ready to sleep, nothing stops him. Cavaliers: James has scored at least 10 points in 863 straight games, three shy of tying Michael Jordan’s NBA record. James is in line to tie the mark on Wednesday in Charlotte, potentially with Jordan in attendance. … F Jeff Green left with an illness after playing seven minutes in the first quarter and didn’t return. … Drew doesn’t know if Lue will join the team on its upcoming trip to Brooklyn, Miami and Charlotte. Drew visited Lue at his home on Thursday and the two discussed how to integrate the players returning from injuries. … F Kyle Korver won’t return until next week. He’s been away with his family following the death of his younger brother, Kirk. https://www.limaohio.com/wp-content/uploads/sites/54/2018/03/web1_03.24.18.james_.jpgThe Cavaliers’ LeBron James, right, drives past Phoenix’s Davon Reed during Friday night’s game in Cleveland.